Make your stay on the Garden Island of Kauai a memorable one. Our condominium in the Puu Poa complex will enhance the experience. Fall asleep and wake up to the sound of waves landing on Hideways Beach directly below. Sit on the lanai and soak in the Hawaii sun; keep an eye out for migrating whales; or watch the spectacular sunsets over Bali Hai. 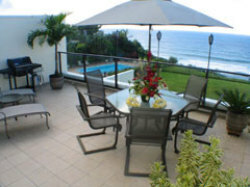 Walk next door to the beautiful Princeville Hotel with outstanding restaurants and shops. Puu Poa has its own private swimming pool and tennis courts. The front lawn stretches right to the edge of the bluff where the endless Pacific Ocean begins. Kauai and our Puu Poa condo are the perfect combination for the ultimate romantic vacation. Take a walk at night on the endless Kauai beaches; wade in the Queen's Bath at the base of the bluffs; and enjoy the sumptuous tropical cuisine at local restaurants. 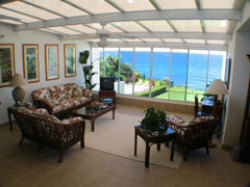 Stand on the lanai or walk out on the front lawn to watch the majestic sunsets. 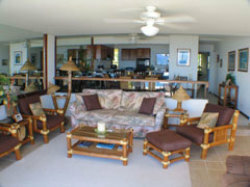 Kauai and this Puu Poa condo are also the perfect combination for the adventurous holiday. Kayak on local rivers or out on the ocean along the Napali cliffs; hike the endless choices of trails; or enjoy the multitude of ocean activities. When the days activities are over, you can return and relax in this very comfortable home away from home. Our condominium offers the luxury of a first class hotel and all the conveniences of home at an affordable price. This condominium is recently decorated with very tasteful, comfortable furnishings and beautiful artwork. 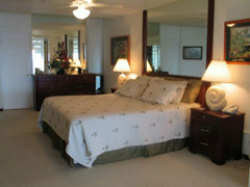 The spacious master bedroom includes a king bed, cable TV, walk-in shower and separate soaking tub. Open the full height shutters onto the sunny glass covered atrium where you can enjoy morning coffee. This spacious condominium has new tile floors, new televisions and sound equipment and new furniture throughout. The second bedroom has a queen bed, TV and separate bath with laundry facilities. The living room includes a queen sofa bed for additional sleeping space, if necessary. Everything is there for that perfect Hawaii vacation.